We wanted to see more of the real Jamaica and Richard didn't disappoint. A great sense of humour from the off and he managed to pack so much into the few hours we were with him, varying the itinerary in line with the things that interested us. We would definitely recommend and will use again. TOUR GUIDE RESPONSE: So happy you valued the tour Andy! I take pleasure in showcasing the very best of my Island and our unique culture. The day's adventure was well worth it! TOUR GUIDE RESPONSE: Thanks for your kind words Ivy! I absolutely had a great time with you guys. I take great pleasure in showing our country to travelers who want to explore this beautiful Island. Richard was great in the morning but then came afternoon vendor shopping. TOUR GUIDE RESPONSE: Thank you for your review. I am so sorry you had a bad experience with the vending segment. Hope the rest of your cruise was a great experience! Richard was a great guide, we didn't have a clear idea of what we wanted to do in Ocho Rios, he showed us beautiful views, lovely neighbourhoods, stayed away from touristy areas (like we wanted) & kept us laughing. A wonderful day! Richard is wonderful, full of wit and humor. He meet us as agreed and provided an exceptional tour of the area. Stopping often for photos, he was great in recommending out of the way places full of charm that we should visit where the tour busses can't go. If you are touring anywhere close to his hometown area of Ocho Rios, Richard is the guide you should be using. The tour with Richard was exactly what I've come to expect from Tours By Locals. An excursion provided by an extremely competent guide, fascinating places to visit, informative commentary, comfortable travel accommodations, and a lifetime of memories. Richard excelled at all of the above. Plus a witty and dry sense of humor. The other travelers thanked me profusely for arranging the tour. The icing on the cake was Jamaican cuisine at a local restaurant to acquire the full "flavor" of Jamaica! TOUR GUIDE RESPONSE: Thank you so much for your great review, Jon! Absolutely appreciated! I am so happy you all were happy with the service I provided. I love my country and that makes me really happy showing it to every one who takes the time and interest to visit our shores. Blessings! Richard. Richard gave us a super tour exactly as we wanted. It was a day full of fun experiencing the culture, history, and tastes of Jamaica in great company. TOUR GUIDE RESPONSE: You are most welcome Deirdre! Thank you for choosing us. We really appreciate you using our service. TOUR GUIDE RESPONSE: Thank you Corinne and Peter! Actually, you were great sports! I am happy you had a good time on the Island! Best wishes, Richard. TOUR GUIDE RESPONSE: Thanks for your positive feedback Oliver. I am happy you had a wonderful day! TOUR GUIDE RESPONSE: Thanks for visiting the Island Scott! So sorry you had to contend with such a crowd. I was happy to share my part of the world with you! TOUR GUIDE RESPONSE: Thank you Andrea. I am happy you had a good time! Richard was not only a great guide but also very funny. He made our day very enjoyable. If your looking for a private guide in Falmouth or Ocho Rios he is the best. TOUR GUIDE RESPONSE: Thanks for the endorsement Fred! I am so happy you enjoyed the day on the Island. The pleasure was all mine providing you with this service. Happy New Year! We had a wonderful time on Richard's tour - he was excellent. The refreshing beverages in the cooler were much appreciated by all, and the visit to Scotchies for local food was exactly what we wanted. Richard went above and beyond in seeing my parents' mobility difficulties and switching vans with his son mid-way through the day so that they could get in and out more easily. Highly recommended - thank you, Richard! TOUR GUIDE RESPONSE: Laurie, you are much too kind. Thank you for this wonderful review. I am so happy your family felt comfortable with me. I do take pleasure in taking care of visitors who come to see my country. I am glad you all had a good time and I do hope you will come to visit again. Kindest regards, Richard. Richard was very effective and accommodating as a tour guide, we would highly recommend anyone using him! He was also very personable and we enjoyed being with him. TOUR GUIDE RESPONSE: Thank you Bernard! The pleasure was all mine. I take pleasure in showing off my country to travelers who are so intrigued with our Island. Thanks again for choosing Toursbylocals.com and for choosing me as your driver /guide. Kindest regards, Richard. Richard was wonderful on every level! His vast knowledge of the island and terrific sense of humor sparkled throughout every mile of our adventure. He chose the perfect spot for lunch and went the "extra mile" to accommodate our spontaneous request to visit places off the beaten path. Our other cruise tours paled in comparison to his. Thanks to Richard, we will always cherish how welcome we felt in Ocho Rios. Tom & Nicki H.
TOUR GUIDE RESPONSE: Tom and Nicki! Thank you both so much for this awesome review of the service I provided. I am so happy you both had fun. I take so much pleasure in exploring this beautiful island with my all my guests. Thank you for choosing to travel with Toursbylocal.com and for choosing me as your local guide. Thanks again and best wishes. Regards, Richard. .
Richard is the perfect guide with any tour you decide to take. He's friendly, funny, conscientious, a good and safe driver, and flexible to changes in the itinerary. Plus he brought cold drinks to share. We arrived on a cruise ship and Richard told us via message that we could invite the new friends that we wanted to bring with us. We also decided to skip Bob Marley and do a highlight trip instead. He tailored our day to our interests. He's very friendly and seemed to enjoy our company and many questions. TOUR GUIDE RESPONSE: Thank you Barbara! The pleasure was all mine. I am happy you all had a great day on the Island. Hope that you will visit us again. Richard. Mit Richard haben wir mit Sicherheit die bis jetzt lustigste Führung verbracht. Sein Talent für Humor und Sprachen haben diesen Tag im Nu verfliegen lassen. Es versteht sich von selbst, dass er nach vielen Jahren Erfahrung auf jede Frage auch die richtige Antwort hat. Die Bedeutung des Wortes "Schlagloch" wurde uns in einer uns bis jetzt nicht bekannten Form erklärt ;-)! Sollten wir die Chance haben, wieder einmal nach Jamaica zu kommen, würden wir mit Sicherheit wieder Richard anfunken! TOUR GUIDE RESPONSE: Thanks for your 5 star rating Sean! Thank you Richard for that excellent service. It was really a great experience! TOUR GUIDE RESPONSE: Happy you enjoyed your day Christian! Thanks for choosing ToursByLocals.com and me as your guide. Had a great day out with Richard, he is very knowledgeable, he was easy to understand , has a great sense of humour and made it an enjoyable day. I feel we now know a lot more about Ocho Rios and the Jamaican people. TOUR GUIDE RESPONSE: Thanks for your kind words Peter! I am happy you both had a great time and that the tour gave you an insight of my country and my people. Thanks for choosing me and ToursByLocals.com. King regards, Richard. TOUR GUIDE RESPONSE: Mark, I am so happy your family had a great time here in Jamaica! It was my pleasure taking care of you all. Thanks for choosing ToursByLocals and for allowing me to show you some of the island! Many blessings, Richard. TOUR GUIDE RESPONSE: Thanks for your positive rating Gail!! Regards, Richard. We had an amazing day with Richard entertaining and informing us!! Highly recommend!! TOUR GUIDE RESPONSE: Thank you Linda, it was an awesome day we shared together! cannot go wrong with Richard. TOUR GUIDE RESPONSE: Thanks John, appreciate the endorsement! We had an amazing day exploring Jamaica with Richard! Richard was very prepared, he even had cold drinks and extra towels. He knew the area very well and drove with skill on the crazy road to the Blue Hole. Richard took us to a great local restaurant for authentic jerk chicken and pork. We felt safe and well cared for the whole day. Thanks for making our visit very memorable and fun! TOUR GUIDE RESPONSE: So Happy you had such a wonderful time Laura! The pleasure was all mine to show you a little of our beautiful Island. I take pleasure in showing the world some of the beauties we have here. Blessings, Richard. Richard was amazing! Very knowledgeable and eager to assist us in tracking down my roots on this tour. He had us in stitches with his jokes, some of which were funny!!! TOUR GUIDE RESPONSE: The pleasure was all mine David! Hoping to see you both again. TOUR GUIDE RESPONSE: Thanks for your great review, Jessica! Sorry again for picking you up late. Re your market experience, some customers express their desire to shop on their own so I did not want to impose on your privacy to shop as you would like. My apologies. Thanks again and kind regards. Richard. A long journey there & back flew by with good humour & good music. TOUR GUIDE RESPONSE: Thank you Pauline! The pleasure was all mine. Regards, Richard. Richard was very forthcoming, friendly and informative. Spent almost an hour more with us because of a delay at the gate to the port in the morning. Good music in the car, interesting information about the area and the people - overall a perfect time spent seeing as much as possible in one day! TOUR GUIDE RESPONSE: Thanks for the "thumbs up" Christian! So happy you had a good tour. Your were great company too. All the best! Richard. Richard did a fine job. He understood what we were interesting in doing (wandering in quiet, natural settings), and helped us find just what we were looking for. He has a relaxed, friendly manner; and provided interesting insight into life in the area. TOUR GUIDE RESPONSE: Thank you Ken. I am so happy you loved your tour. Blessings, Richard. Richard is a wonderful tour guide. He's funny, careful driver, and showed us Beautiful Jamaica, that we wouldn't have seen if we stayed in port. TOUR GUIDE RESPONSE: Thanks for the great day we spent together Paul and Ann. Lets do this again sometime in the near future! Enjoy the rest of your cruise. Regards, Richard. Richard was great and we would highly recommend him! He took us to places we never would have known about or seen on our own. His sense of humor and knowledge of the island were incredible. We felt safe at all times. The 6 hours we booked flew by. This was so much better than booking separate excursions from our resort as it allowed us to be in control of our day. TOUR GUIDE RESPONSE: Thanks for your kind remarks Sally! We did have an awesome day. I am happy you all enjoyed the tour, and hoping that the rest of your cruise was just as great! Blessings, Richard. The tour was amazing, meeting was exactly at time. Richard speaks a little bit German, this was really good for us. Unfortunately the time was to short to see more. Richard gave us so many impressions and informations about Jamaica, thanks a lot. TOUR GUIDE RESPONSE: Thanks for your glowing feedback Andreas! You guys were great fun! So sorry we did not have more time to explore more of the Island together. Thanks again for a great day! Best wishes, Richard. TOUR GUIDE RESPONSE: Thank you and your family for the wonderful time we spent together while you visited the Island. Wishing you all the best. Regards, Richard. My wife and I had a great time on tour with Richard. He made it really awesome for us. We would highly recommend anyone visiting Ocho Rios to have Richard as their tour guide. He is fun , courteous , knowledgeable and a great company to have. TOUR GUIDE RESPONSE: Thank you both so much for this glowing review. I take pleasure in providing my customers with the best possible service. Happy you had a great tour and hope you will visit the Island again, soon. Best wishes, Richard. Richard was so personable. He was friendly from the start and filled us in on the history. He actively involved my kids (ages 8, 14, 18). He never acted irritated or put out with any of my kids. He went above and beyond and gave us a small side trip as we were driving and gave a little bit more of a history lesson. We could not have asked for more. First class service and never implied or acted like he was expecting a tip but he was well worth what we paid. TOUR GUIDE RESPONSE: Thank you Angella for your kind review. I am so happy your family had a great time, especially the kids. I am glad you got your monies worth and I really appreciate you using our tour service. ToursByLocals.com and myself look forward to providing your family with great service again. Blessings, Richard. Our guide was very friendly and professional. We felt very comfortable with him and would not hesitate to use Tours by Locals again and would certainly love to tour with Oneil in Ocho Rios again!! Richard was awesome! We had a blast. Thank you so much, Richard! TOUR GUIDE RESPONSE: Happy you had a blast guys! You were awesome sports too! Lets do this again sometime soon!! Richard was a fantastic tour guide and our day with him was a highlight of our holiday. He was humorous as well as informative and provided a superb service. TOUR GUIDE RESPONSE: Thank you so much Christine, Alan, Pam and Keith! You were all great sports! You made the tour easy and enjoyable so my work day was actually a play day! Thanks again for choosing me to show you some of this beautiful Island and for booking with ToursByLocals.com. Best wishes, Richard. In spite of the rain we had a great day with Richard. He suggested a change of plans, due to the weather. We toured the countryside, stopped at a coffee plantation, drove through villages in the mountains, had lunch at Scotchie's which was a real treat! Toured the area to the East of Ocho Rios, stopped at grocery store at our request where we bought locally made hot sauces. We loved his sense of humor, easy going manner, and intelligence. Richard will take you where you want to go & get you what you want! TOUR GUIDE RESPONSE: Thank you Annette and Jeff for reviewing my service. I am so happy that in spite of the very bad weather you still had some fun. It was my absolute pleasure showing you some of the Island. Wish we had sunshine then but the Creator had other plans. Thanks again and all the best for 2015! Richard. Richard provided excellent service and was very willing to accommodate us in every possible way. His sense of humor and knowledge of Jamaica was great and I would highly recommend him if you are looking for an excellent and caring guide. TOUR GUIDE RESPONSE: Thank you Daniel. The pleasure was all mine. I really appreciate you experiencing some of the Island with me. Hope you had a great tour! Best wishes, Richard. Interesting tour and Richard's personality and sense of humor will make up for any shortage you may encounter. We will definitely re-contact Richard the next time we visit Jamaica. Richard was terrific as our tour guide in and around Ocho Rios. He did exactly what we wanted, a tour of the countryside and not touristy stuff. He was very knowledgeable about the area, took us to a small coffee plantation and we had lunch at a very nice but authentic Jerk Restaurant. He was very nice with my elderly mother but also was fun with the rest of us! I would highly recommend Richard! TOUR GUIDE RESPONSE: Thank you Deborah and family. I am so happy you all had fun exploring some of the Island. I take great pleasure in showing off my country. Thanks for the wonderful day we spent together. Best wishes, Richard. Richard is an amazing and accommodating guide. I think we saw more of the Ochee area in a day than most see in a week. He knows the area "like the back of his hand" and will infuse your tour with a sense of history, respect for the local culture and a sense of humor when you least expect it. Our day with Richard was the highlight of our visit to Jamaica. TOUR GUIDE RESPONSE: Thank you so much Ruth!! I am so happy you all enjoyed your tour of the area. I just love showing off my beautiful Island to all who choose to visit our shores. Thank you all for a wonderful day with your family and your thoughtfulness. Wishing you all good health and happiness for 2014. Blessings, Richard. TOUR GUIDE RESPONSE: Thank you Mr. and Mrs. Kemp. I am so happy you had a great day on your tour in Jamaica! It was my pleasure providing this service. Warm wishes, Richard. Richard did an excellent job, I highly recommend Richard for any of his tours in Jamaica. He was very personable and knowledgeable and very good driver. He provided a stocked cooler for us as well as a courtesy. Very reasonable rates and worth every penny. Thank you Richard. Next time in Jamaica we will definitely give you a call. TOUR GUIDE RESPONSE: Mr. Douglas, thank you so much for your kind words, I really do appreciate your compliment. I am so happy you both enjoyed your day's tour and that you are pleased with the service I provided. The pleasure was all mine. Thanks again and best wishes, Richard. TOUR GUIDE RESPONSE: Hi Greg, so happy you all had fun and was informed on the areas we visited. Happy also to have added a little humor t the whole adventure! Thanks for making it ToursByLocals.com and we are looking forward to providing you with lots more wonderful travel experience!! Regards, Richard in Jamaica! Richard is an amazing tour guide.....he did whatever we desired and helped to make our day on the Island memorable. His wonderful sense of humor is a nioe bonus to an already fantastic personality. I will definatley being looking to use him again whenever we are in Jamaica. Highly recommended!!!! TOUR GUIDE RESPONSE: Hi Elizabeth, I am so happy you all had a wonderful time when you visited Jamaica on January 28th. I just love showing off my country and taking care of my guests and visitors to the Island. You all were such a happy bunch, I had a great time too just spending time with you all. Thanks for your awesome review and hoping to see you all again soon!! Warm regards, Richie in Jamaica. TOUR GUIDE RESPONSE: Thanks to the Thibaut family. We had a great day together in Ocho Rios, Jamaica! I enjoyed showing you my beautiful country. Richard was great he made you feel like a friend that you have known for years. He showed us all the great spots. What a great deal compared to the price on the cruise ship to the falls and the other spots he showed us. TOUR GUIDE RESPONSE: Thank you so much for your kind words Sandra!! 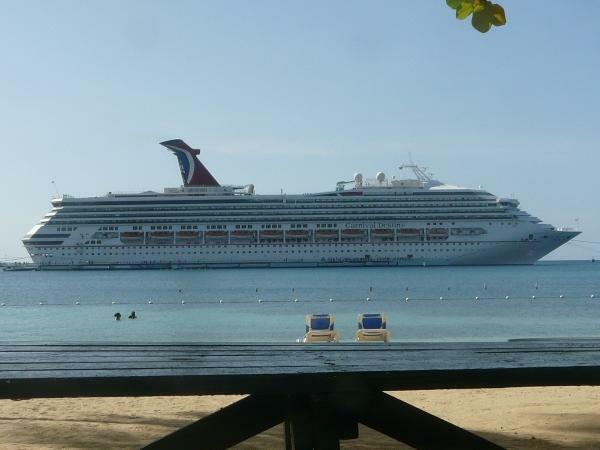 I am so happy you and yours enjoyed your stop here in Jamaica and I was able to add value to your cruise. I truly enjoy showing our beautiful Island to travelers from all over the world. ToursByLocals takes pride in providing the very best tour guides for its guests worldwide. Hoping to serve you again in the near future!! Kind regards, Richard in Jamaica.